One of the things Windows 7 is missing is the highly popular stack function found in other operating systems (I refuse to type them). I prefer my desktop to have easy access to commonly used programs, but I also do not want the desktop cluttered with dozens of icons. A few icons on the desktop are perfectly fine, but I'm no Jabroni when it comes to cleanliness. Therefore, I went on a virtual quest in search of the perfect method of using stacks in Windows 7. I wanted stacks and I wanted them to look awesome. Too many folks had screenshots of stacks in weird places, like above their toolbars, off to the side, or even free floating around the desktop. This did not suit my purposes well. If it cannot look decent, I would not bother. Luckily I found a way. 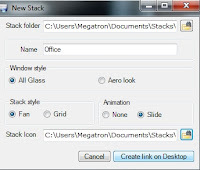 Now, there are a few programs that can create stacks, which are essentially shortcuts listing other shortcuts: Win7Stack, 7stack, and Piles for Windows to name several. I prefer Win7Stack as it has a simpler interface and it lists icons in a smoother interface. It is also extremely easy to use your own icon image instead of pre-programmed Windows icons. Find one of the above you like, download, install, and move on. Next you need to make your stack folders. Each program needs you to make a folder with all the shortcuts in it first. Name the folder whatever you want it to show when you click it. I have folders called Office, Adobe, GIS, CAD, Toolz, Maintenance, and Game time, each with their respective shortcuts. Also, include your icon file in each folder as well. I store all my stacks in a folder called Stacks in My Documents, along with some Start orbs as well. Now it is time to make your stacks. 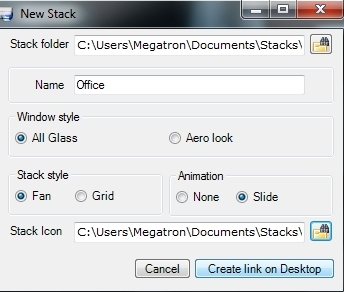 Find your stack folder's and icon's path, then click "Create link on Desktop," or the equivalent on other software. Mess around with the the different styles to see what you prefer. I prefer the default settings as they are simple, unintrusive, and smooth. That is it for today's post. Remember to have the stack icon image you want to use converted to .ICO extension. PNGs might work, but not as well as ICO. Tomorrow we will show you a couple tricks to formatting stacks onto the toolbar. This entry was posted on October 4, 2009 at 12:14 pm, and is filed under computer, customize, windows 7 . Follow any responses to this post through RSS. You can leave a response, or trackback from your own site. great idea! i will definitely be doing this. Unfortunately, I'm still stuck in 2006 with Windows XP, or else this would be really helpful to me. Great blog, though! You really know you're stuff! Thanks, this actually helps me out a lot and makes it easier. I will test it, thank you. 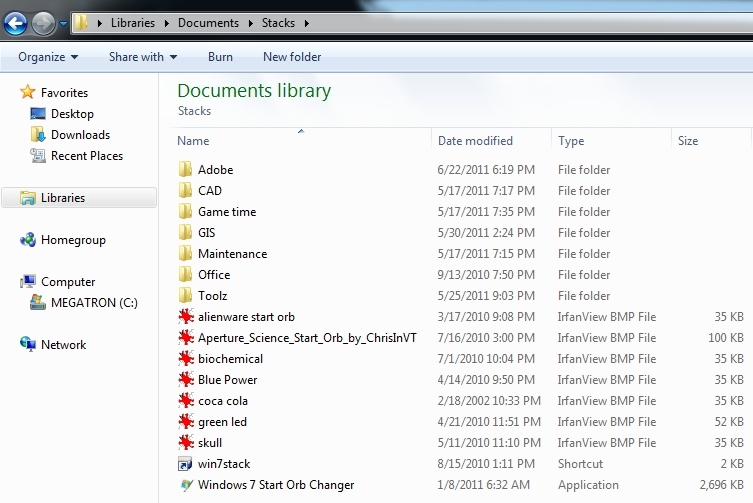 Stacks are pretty useful for windows 7. Nice, I love little mods like this, they make all the difference.